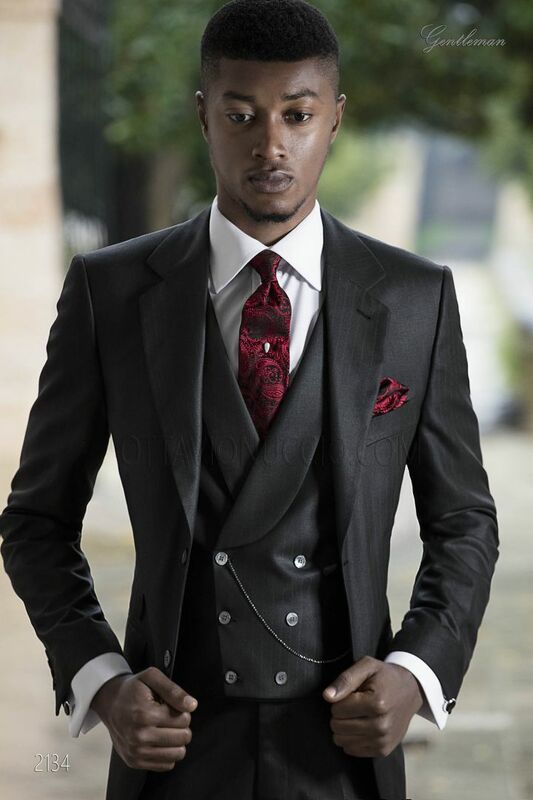 Tuxedo groom suit for men in black-red pinstriped, slim fit. Notched lapel with 2 corozo buttons closure. Flap pockets, ... Tuxedo groom suit for men in black-red pinstriped, slim fit. Notched lapel with 2 corozo buttons closure. Flap pockets, ticket pocket on right side to make the look more casual and angled buttonholes. 3 customized buttons for each sleeve and 2 vents at back. Rounded finish to stylize the figure and tail of jacket suitable for any height. Double-breasted waistcoat and 6 mother-of-pearl buttons closure and 2 double welt pockets Back lining with elastic band ... Double-breasted waistcoat and 6 mother-of-pearl buttons closure and 2 double welt pockets Back lining with elastic band to adjust width. 8.5cm tie and handkerchief set made from red and black jacquard silk paisley pattern. Handmade.